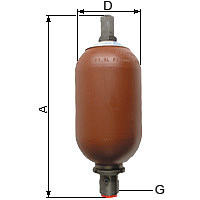 Hydraulic accumulators are pressure tanks and are bound to the national health and safety law. The Pressure Equipment Directive and Ordinance on Industrial Safety and Health are authoritative in germany. 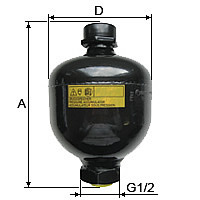 According to this every pressure tank has to be secured with a safety valve (TÜV-approval). Membrane and sealing made of Perbunan (NBR). Membrane accumulators are manufactured, tested and documented according to Pressure Equipment Directive 97/23/EG . Max. Precharge Pressure is 160 bar. Installation preferably perpendicular with oil connection at the bottom. TÜV-type-tested and sealed (certificate included). To attach the accumulator technically correct. Caution, the accumulator tank and respectively the connection must not be under mechanical stress.